A recent round of Google Android software updates have broken the music preview capability of the Google Play Store app. 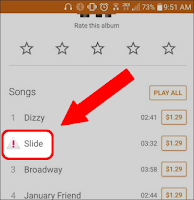 This is a bit of bad news as I like to peruse unfamiliar (to me) free and $0.99 albums routinely offered through the Play store. A number of "try this fix" suggestions have been tossed around the net including clearing Play Store app cache, resetting the app, dropping the registered account and then adding it back, etc. These are, at best, only temporary fixes for the music preview problem. The REAL fix is to update your Google Play Store app to a more recent version. The most recent version(s) must be manually downloaded and installed. I have several Nexus devices (you know -- the line of devices that always get Android updates first?) and they have *not* gotten over-the-air (OTA) updates to the latest Play Store app version, yet. Thankfully it's easy to get your hands on a fixed version from APKMirror, a trusted host of verified (and legal) APK files. Note that the following link is to an official Google release, not some app variant someone cooked up at home. To install this you'll need to go into Android system settings and temporarily allow installation of APK files from unknown sources. I've now tested this update on two different Android devices and have verified it corrects the music preview issue.